It was a great time hosting Ray & Andrea’s Wedding Shower. We are so glad that you could all join us and we’re glad that you had fun learning how to roll Sushi! It’s a beautiful Saturday afternoon and I have to say I’m very excited for an upcoming catering event – my son’s and future daughter-in-laws wedding shower. My wife Ginny is throwing them a Couple’s Wedding Shower and we brainstormed an Iron Chef event as the theme of the wedding shower. That’s right, we are bringing the Food Network’s Kitchen Stadium Stadium right to our home and we are going to setup a fantastic and fun-filled event! We are planning to have a few appetizers already prepared such as Chinese dumplings, yaki-soba noodles and avocado salad. Then, I’m going get into the teaching mode and educate all the guests how to roll their own makimono sushi rolls so they can each have a culinary battle amongst each other in terms of rolling the best sushi roll. 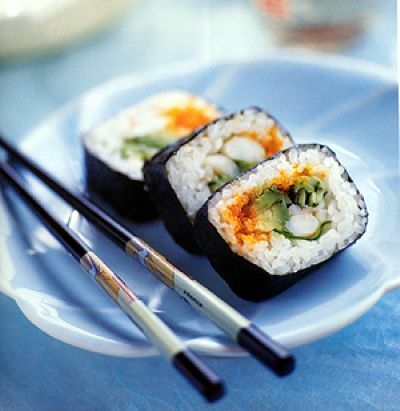 Ingredients will include Eel, Shrimp Tempura, Avocado, Sweet Potato, Scallions, Creme Cheese, Tuna and Salmon. Of course, condiments will be available such as differnt spice flakes, mayonnaise and wasabi. We as a family and all the invited guests are very much looking forward to this! We hope you will too and we will provide videos and pictures for that day. If you would like me to create your own Iron Chef Sushi Battle for any event, please let me know! Chef Chang-San, your personal sushi-chef.